New York Times bestselling and Edgar Award-winning author Lisa Scottoline is loved by millions of readers for her suspenseful novels about family and justice. Scottoline delivers once again with Keep Quiet, an emotionally gripping and complex story about one man's split-second decision to protect his son –and the devastating consequences that follow. Jake Buckman's relationship with his sixteen-year-old son Ryan is not an easy one, so at the urging of his loving wife, Pam, Jake goes alone to pick up Ryan at their suburban movie theater. On the way home, Ryan asks to drive on a deserted road, and Jake sees it as a chance to make a connection. However, what starts as a father-son bonding opportunity instantly turns into a nightmare. Tragedy strikes, and with Ryan's entire future hanging in the balance, Jake is forced to make a split-second decision that plunges them both into a world of guilt and lies. Without ever meaning to, Jake and Ryan find themselves living under the crushing weight of their secret, which threatens to tear their family to shreds and ruin them all. 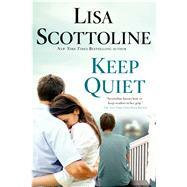 LISA SCOTTOLINE is a New York Times bestselling and Edgar Award–winning author of twenty-two novels. She has 30 million copies of her books in print in the United States, and has been published in thirty-five countries. She has served as the prresident of Mystery Writers of America, and her thrillers have been optioned for television and film. She also writes a weekly humor column with her daughter, Francesca Serritella, for The Philadelphia Inquirer, and those critically acclaimed stories have been adapted into a series of memoirs, the first of which is entitled Why My Third Husband Will Be a Dog. She lives in the Philadelphia area with an array of disobedient pets.